Dim Sum brunches in Shanghai are a must-do whether you’re a visitor or local. There are famous hot spots to slurp soup dumplings such as Jia Jia Tang Bao 佳家汤包, but if you want to dim sum in Cantonese style then Canton Table in Bund No. 3 is the spot to do so. Expect a beautiful space on the Bund, an impressive view, and a dim sum menu with a couple of twists. Apart from typical dim sum fare, the fire roasted chicken & slow braised beef soup were definitely brunch highlights and must orders. We ordered these two meaty dishes to share for the table and they were delicately served on the side via a separate display table. The name ‘beef soup’ may seem unassuming, but the thick cuts of quality beef and pieces radish that have been simmered in fatty stock made for the perfect winter combination. As for the phenomenal roast chicken, it was served with a little fire show that only added to its wow factor. From the colorful dim sum spread we tried, the lightly fried Har Gau with crispy garlic on top was my favorite. I normally hesitate to get fried dim sum in fear that they are over-done, meaning all the juicy stock (which is the whole point of wrapping meats and veggies in such beautiful wrappers) is gone. Luckily in the case of Canton Table’s fried Har Gau, the execution was impressive and the slightly crispy skin perfectly enveloped the tasty prawn filling. We were also quite curious about the Black Truffle Tarts but as a fellow brunch companion Michelle said, it was “Shanghai in a (pie)shell.” In other words, buttery crust and creamy filling but the black truffle was slightly over the top. 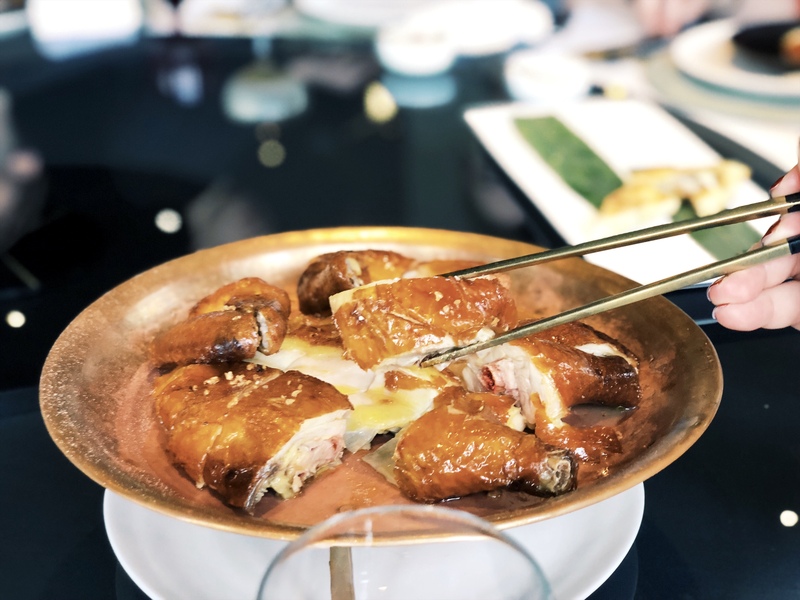 I would definitely visit Canton Table for brunch again–it’s not the nitty gritty Cantonese style dim sum nor the spot to expect local Shanghainese prices, but the quality of dim sum, variety of dishes, and execution are all impressive. Service is a little spotty depending on whomever is tending to your table, but consistency will hopefully improve. The modern Shanghai-style interiors paired with an unparalleled Bund view add to the restaurant’s charm. After all, it’s another charming restaurant designed by Neri & Hu. All in all, Canton Table is a great spot for dim sum on the weekend and the restaurant’s extensive cocktail list means you can lavishly spend your afternoon enjoying dim sum after dim sum.